Enigmatic Bali is the proverbial jewel in the crown of Indonesian tourism. The Hindu enclave has long entranced foreigners, from artists and writers in the 19th century through to surfers in the 20th century and these days, well, pretty much everyone from budget-conscious backpackers through to well-heeled luxury travellers from around the world come to Bali. There’s a reason the crowds come and it’s this: Bali pretty much offers anything a traveller might want. It’s beautiful, the culture is rich and fascinating, it’s cheap (or at least consistently excellent value for money), the geography is stunning, the shopping eclectic, cuisine wide-ranging and delicious, and the people friendly. In short, Bali is really what other destinations try to conjure themselves up to be when seeking to entice tourists. The challenge of a holiday in Bali is not to find something to do or hunt down a fabulous place to hang your backpack/kaftan/Louis Vuitton luggage: it’s successfully whittling down the enormous list of possibilities to a few manageable items. Let’s begin with the beaches. Kuta, a long arch of sand that stretches into Legian and Seminyak beaches, was the original beach of choice for surfers who first started straggling into Bali in the 1960s. These days Kuta still attracts beginner surfers, with its gentle breaks and array of surf schools vying for the attention of newbies. But people come to just hang out on the beach, swim and party as well. Those seeking big nights out tend to gravitate to the Kuta/Legian area, with the style of parties tending to get more sophisticated and exclusive (generally speaking) as one heads north toward Seminyak and then to a lesser extent the much quieter Canggu area. Thumping bars, gourmet restaurants and designer shops vie for the attention of the crowd’s right across this patch of Bali. This is a good spot for families with older kids, with attractions such as Waterbom Park and loads of water sports on offer. Sanur, on the east side of the island, is another of the island’s original beach resort areas. What it lacks these days in terms of trendiness it more than makes up for in terms of easygoing-ness. The beach is fringed by a reef meaning the shore is safe for kids’ swimming, and a boardwalk along the beach makes pram pushing a pleasant rather than frought experience. From either coast, head up north through patchwork rice paddies to the cooler hills of Ubud, the island’s cultural and artistic heart. Check out the Monkey Forest, a revered temple sanctuary where primates who can be a bit naughty are boss. As well, look up eccentric Victor Mason and book in for a bird-watching ramble through the paddies. Ubud’s dining choices in particular are superb, whether you’re after cheap and cheerful, authentic Indonesian or a world-class degustation. Cooler than Ubud still is the fruit and veg capital of Bali, Bedugal. Wander around the lush Bedugal Botanical Gardens — where Bali Treetop Adventure, which boasts an array of adventure circuits that include flying foxes, spider nets and swings — and perhaps try your hand at strawberry picking as well. Across the northern and eastern coast are plenty of opportunities for diving or snorkeling. Padang Bai, Candidasa and Amed are sleepy but pretty resort areas to the east, while Lovina and Pemuteran are lovely northern spots. The west is more remote and rugged, though with some worthy destinations: Balian beach is suited for surfing rather than swimming, but has a sprinkling of pretty places to stay and slip into the quieter way of traditional Balinese life. To the far south of the island lies Tanjung Bukit, home to plush Nusa Dua and an array of exclusive resorts nestled into cliffs with breathtaking views of the Indian Ocean. Nusa Dua was deliberately developed as a high-end wealth traveller’s ghetto. It mostly is, but the beach is publicly accessible and often you may eat a meal at a resort and use their pool and other facilities — check ahead of time. Other beaches around the Bukit are also publicly accessible and are some of the most stunning spots on the island: Padang Padang, Balangan and Nyang Nyang are all breathtaking. The former two have a few warungs to keep you fed and watered, but Nyang Nyang is a bring-your-own picnic affair with somewhat tricky access. A must-see (albeit very touristy) on the Bukit is the kecak performance at Pura Uluwatu, when more than 100 Balinese portray the classic Hindu epic, the Ramayana, with dancing and amazing rhythmic chanting. After the dance head back to Jimbaran, where warung after warung sets up candlelit tables on the sand and serves barbecued seafood freshly plucked from the waters lapping nearby. Select your own fish, prawns and mussels which are served with rice, vegetables and an array of tempting condiments, light or heavy on the chilli. Don’t forget to factor in time for a spa visit while in Bali. The spa at Ayana, the former Ritz-Carlton, is repeatedly voted as one of the world’s best and if you have the money, is a worthy splurge. 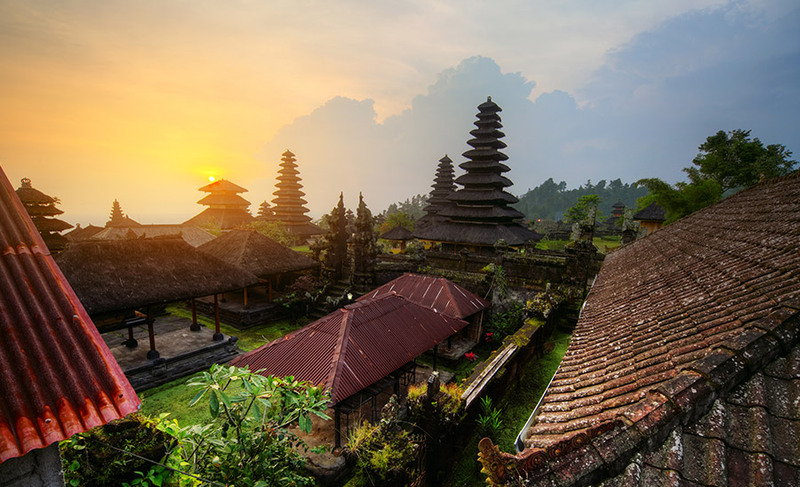 If you’re a little adventurous, consider spending some time in Bali and then some time elsewhere in Indonesia, which offers a bounty of other stunning, less touristed islands that could really use your tourist dollar. Lombok, Komodo and Flores, for starters, are all remarkable to see. They’re challenging destinations but more than reward travellers who make the effort to get there; and you may be the first among your friends to actually see some of these islands.